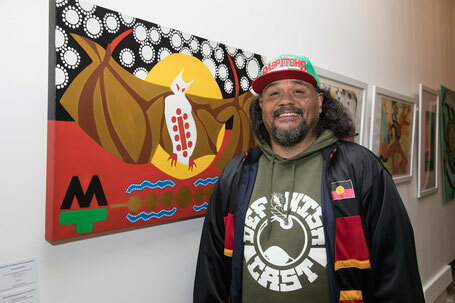 Kevin Winanggaay May is a Wiradjuri man and has been a member of Boomalli since the early nineties. Kevin grew up in Erskinville and Mount Druitt and has lived in Marrickville, Sydney for the past sixteen years. Kevin spent two years in Dubbo completing a cultural course. He learnt map reading and how to survey the land. He learnt about country and traditional medicine. Kevin also spent time living in South Nowra and working with Doonooch Dance Company. Kevin has worked with Life Without Barriers, worked as a Culture Site Officer and as a Cartoonist for the ABC. In the late nineties Kevin and his Mum organised and ran the Sacred Run across Australia with visiting Native American Indians. Kevin currently works in children's education, teaching kids about culture and country. He teaches them about symbols, the elements and their environment. Kevin has a distinct artistic style that is inspired by culture, Dreamtime stories and the environment. In 2018 Kevin curated the Boomalli Men’s Exhibition ‘Black Fellas Dreaming’.